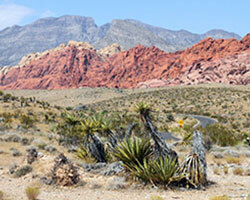 Get away from the lights and distractions of the strip and enjoy the scenic side of Las Vegas with a tour of the Red Rock Canyon. This 13 mile loop in the Red Rock Canyon takes you through the park with great opportunities for sightseeing and photographs, and you'll also reach an altitude of 1,000 feet through the course of the trip. Note: This tour has a maximum 4 hours in duration starting from your hotel. 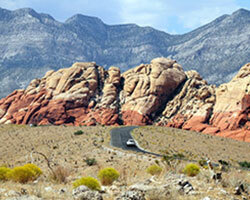 This tour is one way to and from Red Rock Canyon with one 15 minute photo stop. There are no additional stops. If more time is needed then we will charge in 30 minute increments. Tour schedules start at 6am to 4:30pm daily. Closing time varies by season. Rates do not include the Park Entrance Fee. You will be responsible for paying the fee at the entrance. 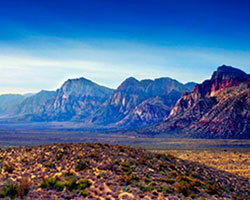 Location is 20 mile from the Vegas Strip. Complimentary bottle of champagne, red wine or white wine with each reservation.